In 2007, Initial Coin Offerings (ICOs) have gained a lot of attention from fundraisers, raising around $13 million per project on average. While ICOs flourished in number and size, people started to realize its shortcomings: more than 90% of ICOs projects’ roadmaps were not actualized. Increasing awareness has also been put on ICOs by the regulators. With the sluggishness of ICOs, people have started to turn to Security Token Offerings (STO), the next significant crypto trend. In this blog we’ll cover how to launch an STO and what key factors make up a successful offering. Part 1: Starting an STO: Is it right for you? *Disclaimer: This is NOT legal advice. This is a basic overview of the processes associated with getting started with an STO. If you’re considering launching your own STO contact a lawyer to ensure that you comply with all the relevant regulations that may pertain to your business or offering. This blog does not consist of legal advice. Part 1. An STO: Is it right for you? A security token represents the ownership and the rights entitled with securities. Security holders are entitled to an array of rights including equity, dividends, profit sharing rights, voting rights, etc. By taking advantage of Blockchain technology, these rights are written into a smart contract and traded freely as a token. These tokens are usually backed by real assets and comply with regulations. Initial Public Offerings (IPOs) are the most traditional and mature way of raising funds. Compared with ICOs and STOs, IPOs are more regulated and difficult to launch. The financial cost can be huge and listing processes can be complicated. On the contrary, Initial Coin Offerings (ICOs) based on blockchain technology greatly reduced the investment threshold and issuing difficulty. It allows more efficient and convenient trade of tokens. However, as ICOs are non-regulated, security is generally low. Security Token Offerings (STOs) are deemed to be the middle of both fundraising schemes in regulation, convenience and issuance difficulties. It can, on one hand, reduce the issuance cost, increase efficiency, and complies with the regulating process. Investors, therefore, will be more confident in STO projects. Starting an STO makes sense for a wide range of industries and is viewed as an easier gate compared with IPO. Therefore, it is not impossible for a firm to first launches an STO and then go for an IPO. STOs are especially suitable for companies who have great ideas and have resources in the crypto industry. However, don’t consider starting an STO just because of the buzz associated with blockchain and STO. The cost incurred in STOs differs from case to case. For reserving a token symbol on Polymath, it cost 250 POLY. Further creation of token and token contract will cost another 20,250 POLY. The minimum cost for token issuance with Polymath will then be 20,500 POLY which is around USD 4,500 [1: 0.223 15 Nov 2018 03:21 AM (GMT)]. By using the exemption created under Regulation A+, the legal expense ranges from USD 45,000 to USD 55,000. It is a much less expensive option than other exemptions and is frequently called a “mini-IPO”. When choosing which regulation to file under, companies should not only consider the price but also nature of their offerings. Simply speaking, the cost for launching an STO is around USD 100,000 and more if a larger amount of funds is being raised. However, this is just a ballpark estimate, as other complications may arise that could lead to costs being significantly higher. Take this into account before considering starting an STO. Once the token is classified as a security token, it is subjected to legal regulations. There are different exemption requirements in different countries. This may also be one factor when considering where to launch the STOs. These regulations are incredibly important to consider when deciding how to launch an STO. Regulation A+ (limited public offerings): Companies can offer their security token without registration with the SEC for offerings of up to $20 million in a 12-month period (Tier 1) or $50 million in a 12-month period (Tier 2). The issuance of regulation A is comparatively more time-consuming and costly than other regulations. Regulation D (private offerings): Companies can broadly solicit and generally advertise the offering if all investors in the offerings are verified to be accredited investors according to Rule 506C. Companies must fill the “Form D” after the securities are sold. Regulation S (foreign offerings): Companies can have their security tokens offerings take place outside US but cannot involve US investors. For all security token offerings, companies have to draft a prospectus and comply with local security laws requirement, unless qualified for one of the exemption regulations below. The limited amount exemption: Similar to Reg A+ in the US, companies can sell securities up to 5 million euros without drafting a prospectus. The limited network exemption: companies can sell their security freely to up to 150 people per member state. The nominal value exemption: companies can sell their security freely if each security is equal to at least 100,000 euro. Singapore government has an open and welcome attitude towards STOs while they also keep a keen eye on the regulations imposed. Companies must submit and register prospectus to the Monetary Authority of Singapore (MAS) before the STOs unless qualified for one of the exemption requirements stated in A Guide to Digital Token Offerings published by MAS. Huaxing created the following graph to provide clarity on the security token ecosystem. We’ve provided translation and some more detail on this graph below. 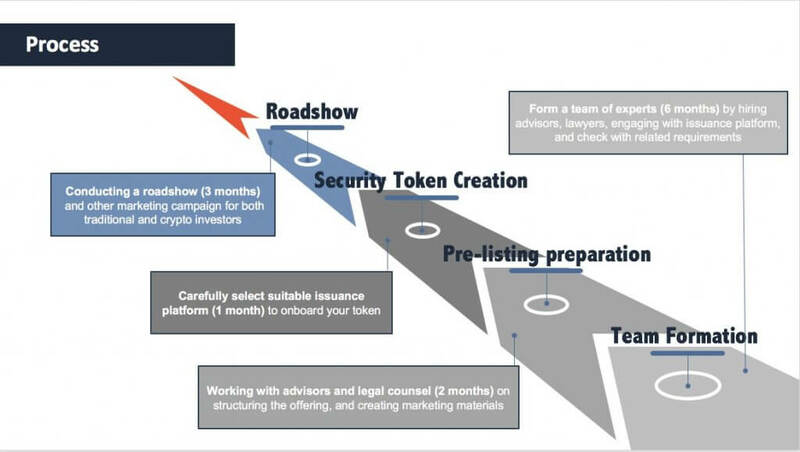 Tatiana Koffman provided more clarity on these important parties on her blog, The Security Token Ecosystem. After understanding the background information and parties involved in the STO ecosystem, the following part will outline the process of how to launch an STO. The whole timeline of an STO lasts for around 1 year with 4 main stages for pre-STO. Preparation always takes up the most time in the STO process. In the first 6 months, a team of experts should be formed to ensure smooth execution in the later part. A diversified team including professionals from various industries such as accounting, development, legal, sales and the marketing industry is essential in providing specific advice for STO process. They serve as consultants throughout the STO launch process. For example, a legal advisor plays an integral role in determing how to launch an STO as they help ensure the security token is compliant with all the regulatory frameworks or exemption requirements. It can be challenging to find an experienced and reliable legal advisor as STO is relatively new to the market. Therefore, finding a suitable legal expert can be a challenging but important task. Other than forming a team of experts who have deep knowledge about cryptocurrency development, it is also the stage to gather information about issuance platforms. It is vital for careful selection of issuance platforms as companies may have different needs and concerns. In this stage, final preparation work on the structure of offerings should be done with advice from the experts. Marketing materials should start to be prepared as well. At this step, the Token Name and Token Symbol will be reserved for 15 days. Creation of Token should be done within the time limit. There is a range of partners including advisory, legal team, KYC/AML providers and marketing team who will offer help for STO. By whitelisting the investors, investors are allowed to participate in the STO. When the investors send POLY or ETH token to the STO contract, the company’s token will be given to the investors. The whitelist can be updated at any time during the STO. The marketing campaign is crucial in introducing and selling the security token to the potential crypto investors. Information such as team members, whitepaper and token structure would be valued by the potential crypto investors. It is important to make sure this information is delivered effectively to the right type of investors. Marketing campaign format may include roadshow, mail marketing and social media channels. Building trust and promoting the security token are the major objectives of these activities. However, depending on the regulations and in which jurisdiction the STO is registered in, you will need to be careful with your marketing efforts, as there are laws against promoting certain types of investments. You can learn more about this in one of our other blogs below. Then it will proceed to the sale of a security token. Provide community support on various social media and crypto platforms. The support services offered can maintain a good relationship with investors and respond to their enquiries. All in all, STO is the next biggest crypto trend after the slowdown in ICOs. We can see a large market potential for STO. Carlos Domingo, founder of SPICE Venture Capital also commented on the size of the security token market. To capture this opportunity, companies should start to understand what an STO is and be prepared. However, the steps necessary for how to launch an STO are likely to change as regulators adapt and new players enter the industry.